Have developed facial and neck wrinkles. 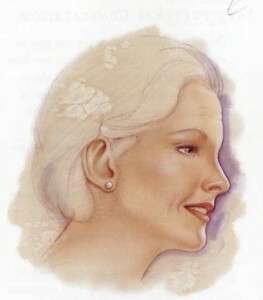 Believe they lack youthful chin and neck contours. Think they have a tired facial appearance. Face-lifts range in size from “endoscopic mid-face lifting” to “standard” depending on location and extent of skin laxity and amount and location of sagging. The operation is done under general anesthesia. Standard Face Lifiting: Incisions started within the hairline (or along the hair margin) above the ear, and extend down around the lobe. The incisions end in or below the hairline behind the ear. Once the incision is made, the subcutaneous layers and neck muscles are tightened, the facial skin is redraped and lifted, and the excess skin is removed. Patients go home with their heads and necks wrapped in dressings, which are usually removed the next day. Or they can stay in hospital overnight and go home with only a face corset the following day. All sutures are removed within 10 days. Bruising and swelling decrease to “socially acceptable” levels in 10 to 20 days. Because this procedure is considered cosmetic, it is not covered by insurance. The patient is responsible for payment. The specific risks and the suitability of the facelift procedure for a given individual can be determined only at the time of consultation. All surgical procedures have some degree of risk. Minor complications that do not affect the outcome occur occasionally. Major complications are unusual. Face rejuvenations is a very popular term nowadays. What are the latest trends in face lifting? Yes it is correct that face rejuvenation is very popular nowadays. In fact, it was also popular last year, the year before and even 100 years ago. Regarding ‘latest trends’ I can say endoscopic face lifting is the number one hot topic. Besides, artistic approach and individual approach to yield the most natural result for each candidate is another hot issue in face lifting. And this is always our main philosophy for face lifting. Can you please describe a typical candidate for a face lifting treatment? And is there an age limitation? 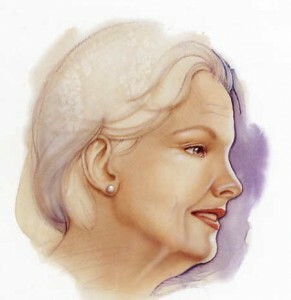 Typical facelift candidates are healthy men and women with skin laxity from the jowls, neck and and prominent facial folds. Generally this includes patients who are in their 40’s to 70’s. Frequently used terms in face lifting treatment are: endoscopic midface lifting and mini lifting. Can you please briefly describe these procedures? Endoscopic face lifting is done with stab incisions are made in the hair bearing skin of the head just above the hair line plus under the eyelids and temple area and finally in the mouth. We use a fiber optic light and endoscopic camera to work inside the mouth so that he I can see to perform the procedure. The soft face tissues i.e skin and fat and muscle are separated from the bone. These soft tissues are lifted and fixed to the bone to a higher level and hard tissues to yield a younger looking. A mini or short scar facelifting is a lifting that is best for patients with some jowling, without excessive amounts of extra skin. This incision is usually limited to in front of and behind the ear. The SMAS which is the strong layer of the face tissue below the skin is folded upon itself with sutures, improving the jowls. Advantages are short scar and maybe slightly faster recovery. Disadvantage is inability to fix extra skin and likely shorter lifespan of the lift. You may need sometimes tuck ups within a couple of years. For how long does the result of a face lifting last? Do you recommend to repeat this treatment? Aging is a continuous process. That means even after face lift you will continue to age. This procedure will be setting the clock back on the aging calendar. Some studies on this particular issue showed that after endoscopic mid face lifting you will look 6-7 years younger than you would if you had not the facelift. After the surgery the patient has to be prepared for a bruising and swelling appearance. How long does it take until the final result is visible and the patient can return to his daily routine? This can vary from individual to individual. Generally speaking it takes two weeks for most of the swelling and any bruising to resolve. It generally takes 1-3 months until the final result is visible. Our patients mostly can return to daily routine in two –three weeks.